SKY-ADS famous letter banners can be read from kilometers away and are assembled Free of Charge ! We create aircraft towed banners 1.5 meters high and up to 35 meters long. Carrying your promotions message to everyone out and about or even just looking out the window ! SKY-ADS a bold visitor from another media, who comes from the Gold Coast with far reaching powers of consumer persuasion. SKY-ADS is the only media medium that effectively reaches your audience on the beaches, or at play on the Gold Coast. How do I get a plane to fly a banner across the sky? What you want to say. Banner Messages can be up to 35 characters long. But spaces do count. Let us know when you would like to fly. Let us know when and how often. SKY-ADS will take care of everything for you. Including the production of your sky banner. One of the main advantages of this form of sky sign is that it is flexible. SKY-ADS has thousands of letters in stock so your promotion can be airborne in as little as 24 hours. Therefore you messages can be in the air with next to no notice and can be changed as often as you like all FREE OF CHARGE! Banner Towing provides the most flexible sky display possible. As a result you have the ability to change your messaging after every flight. Many venues have a different “theme” or “focus” which changes every day or week. If your attraction is in this category, certainty Sky Banners are the advertising media you need. Banners towed behind an aircraft always read better in black. This is because the sky is a very light blue in colour. Therefore Black is the best contrast to the sky and therefore stand out the best. How much does it cost to hire a plane to fly a banner? 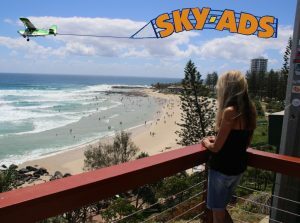 SKY-ADS sky banners start at only $1200 for two passes of the Gold Coast Beaches. Moreover because this flight takes about 2 hours it is remarkable value. Brisbane and the Gold Coast combined for only $1800. 3 hours of banner towing exposure is similarly fantastic value. Gold Coast, around Brisbane and through to the Sunshine Coast. In other words, most of South East Queensland. So, investing $2400 you get Banner Towing past the bulk of the population. If you look at the close up picture above. It shows our banner in flight . You will notice that our Aerial Banners are made up of 4 sections. The Mast. At the very front of the sky banner. This holds the array of letters upright and attaches the entire banner to the aircraft via a long kevlar rope. A connector rod. These are fiberglass poles. Similar to a fishing rod. Spaced evenly along the rod are 8 connecting clips. The letters. Each letter consists of 2 parts. Firstly there are 8 connector tapes which join securely to the rods between words via the connector clips. These tapes are a seatbelt material and are immensely strong. The 8 tapes strung between each rod forms a strong but light lattice. So the second part to the letter is the actual character attached to the eight tapes. The final part of a sky banner is the tail. Although not shown in this picture. The tail provides enough drag to hold the entire banner tow out straight. Our Banner Towing system can quickly assemble any message you require. The only limit is the amount of drag that the aircraft can handle. SKY-ADS mighty little aircraft can carry up to 35 characters. As you can see a space still requires a drag producing connecter rod and therefore needs to be counted. The flexibility to change your message and our aircraft’s low operating costs, this makes Sky Banner Cost the lowest of any form of skywriting.